Peel back the hop’s leafy layers and take a deep breath. Nature’s complexity and personality comes alive as your senses are filled with the possibilities of hops brewed to perfection. The same intricacies and flavor inherent in hops has also seeped into the budding hops industry. Far-out variety names like Amarillo, Crystal, Galaxy and Warrior are grown from large and small farmers that service a global hops economy, catering to a full-bodied and worldwide brewing industry. Despite its vast offerings and reach, it’s a market that American craft brewers are impacting as demand for hops grows. The 18-foot trellises, pitching and drying equipment, trucks, tractors and massive pieces of machinery that site idle for 10 months out of the year all add up for a grower. Given the hefty investment in growing a certain hop variety, growers can’t necessarily adapt quickly enough to meet demand for different varieties. The Centennial and Amarillo demand may have already tipped you off that last year’s hops trends were fueled by bold, hoppy American Indian Pale Ales (IPAs). Matt Hollingbery of Hollingbery and Sons Inc., explained that Cascade, Chinook, Simcoe and Citra were also in high demand last year. Adding flavor to the varieties, more unique hops like the Australian-grown Galaxy — a citrus variety that is close to Citra, but has a hint of mango-y citrus — started to catch on with brewers. Hollingbery and Sons Inc. isa family-owned company that has sourced hops for wholesale, retail, domestic and international customers for more than 65 years from their offices in the Yakima Valley, which is the heart of one of the world’s largest producing hops regions. Certainly, the type of beer that is in style is going to impact the hops industry. “The greatest demand is still for Cascade, Centennial, etc., but another current trend has been for hops that complement the less hop-driven Belgian styles that are popular in U.S. craft brewing now. Sterling, Liberty, Santiam and Meridian hops for example,” said Jim Solberg, president and general manager of Indie Hops, an Oregon-based hops supplier founded in 2009 that does 100 percent of its sales to the craft brewing industry. As beer styles fall in and out of the brewing limelight, the impact will be felt by the hops industry, particularly if the darker porters or stouts find sudden popularity. Mother Nature also has a hand in the hops market. Take Amarillo, for example. Two years ago, there was a shortage because the hop rhizomes were spread too thin and the crop was pushed too far, too fast. Last year, a flood wreaked havoc on two of the major Amarillo hops farms, Simms said. Obviously, hops are an agricultural product, so it takes time for hops growers to produce specific hops. When demand for a certain type of hop comes into vogue, such as the Cascade, Centennial, Chinook or Simcoe aroma hops that brewers are after these days, there are often crop shortages because the trend traditionally has been to grow high alpha hops to reduce bitterness. Recent shortages have pushed hops demands in a different direction. Hops demand isn’t only limited by what American brewers want. It’s an international and unrestricted industry where 75 percent of U.S.-grown hops are exported, primarily to Europe, Hollingbery said. This creates an interesting dynamic where hops demand is based on exchange rates. If the euro is cheaper than the dollar, suppliers will buy more euro hops; if the dollar is cheaper, they’ll buy more American hops. 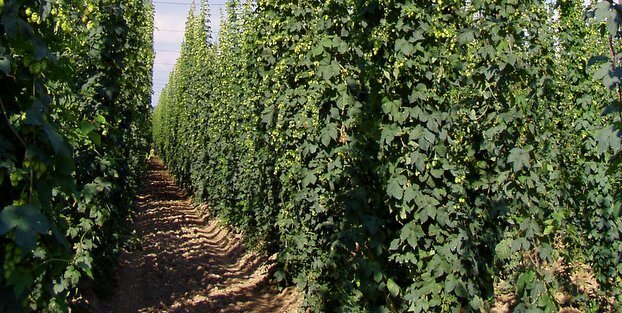 American hops growers also have stiff overseas growing competition as many countries — including Germany, Slovenia, the Ukraine, Poland, China, India and New Zealand — have publicly funded hop improvement and breeding programs. Germany, in particular, has been cranking out interesting hop varieties over the past few years and that chills American growers and dealers to the core. “That means there are going to be interesting European hops that we’re not going to be able to grow. People are going to be looking for those instead of the American hops,” Hollingbery said. As the craft industry grows and hops variety demand ebbs and flows, one of the biggest factors that will continue to impact the hops market, as well as internal industry relationships, is the hops price tag. While brewers want the best quality hops for the lowest price, a scenario like 2012’s shortage of aroma hops introduces the opportunity for price spikes. Combine that with a complex growing and harvesting cycle, and rising distributor costs, and hops buying tension quickly rises. Ward went on to explain the difficulty and cost associated with hop farming — particularly the infrastructure needed to grow the plants. The 18-foot trellises, pitching and drying equipment, trucks, tractors and massive pieces of machinery that site idle for 10 months out of the year all add up for a grower. Given the hefty investment in growing a certain hop variety, growers can’t necessarily adapt quickly enough to meet demand for different varieties. It takes time for hops growers to produce specific hops. When demand for a certain type of hop comes into vogue, such as the Cascade, Centennial, Chinook or Simcoe aroma hops that brewers are after these days, there are often crop shortages because the trend traditionally has been to grow high-alpha hops to reduce bitterness. Depending on your hops demands, you may also want to work out a longer-term contract for a percentage of your estimated hops needs for the year. Hollingbery explained that a long-term contract, like a three-year supplier deal, simply guarantees that a brewery will have a continual supply of hops throughout the year, even if the contract is for half the estimated volume of hops. But he knows how some smaller breweries are wary of multiyear contracts. Timing is everything. For brewers still searching for a hops supplier, time is running out. By the end of March, growers can’t make changes to the crop size. In the winter months, it’s still possible to add or subtract acreage and you can get a sustainable hops price. That’s not to say that you need to know all your hops needs for the year right now. Conventional wisdom is to order the hops you know you’ll need for the styles you regularly brew, and you can fill in the other hop gaps as you go. Label Peelers takes a more laid-back approach to hops sales. Label Peelers is in a unique position where the company picks up its stock locally five days a week. “It keeps our overhead low, and we don’t have to pay for palletized shipping to ourselves. That’s another reason we’ve been doing well — we can offer a really good service at a lower than average price. We have fresh hops. A lot of times, a good percentage of our stock we only have in our hands for about five hours,” Simms explained. Still, having a hops plan is paramount. Sure, quality hops might be available on the spot market, but not always. It’s about riding a fine line of how to create a sustainable business product, while staying spontaneous and experimental with your other beer offerings. Plan for the worst, expect the best, and play with the unknown that comes along throughout the year. Leah Jean Shafer liked this on Facebook. That’s what we are here for. Thanks for reading! fascinating and useful info. thanks.